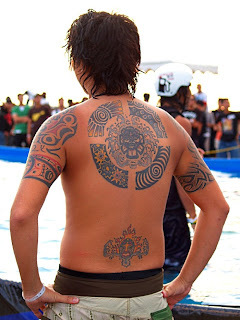 World top ranked Wakeboarders and Wakeskaters exhibition. 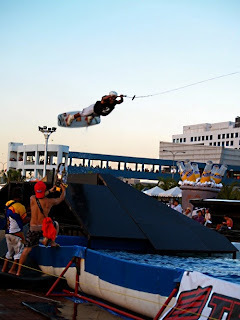 Towed Winchboarding, Wall Climbing, BMX and Skateboarding competition and X-treme Party. 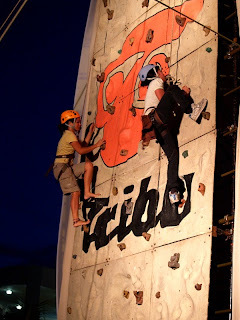 It's Free Entrance, Free thrill, Free (clean) fun, Free entertainment, Free bottled water and Free Beer! 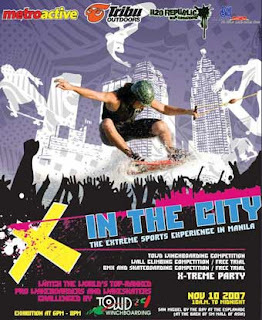 X in the city was presented by MetroActive Magazine, Tribu Outdoors, H2O Republic Wakeboarding and Mall Of Asia. The Billabong wakeboard team will be present to do a demo along with Keith Lidberg, Lu Le, Brandon Thomas and Pat Panakos of The Projects Wakeboard and Wakeskate Camp. Watch out for more photos that I'll be posting in the following days. Hip-hop, Punk, Trash, Boho, laidbacks, Sports and more.